Em's Knitty Corner: At last, an update! Ok, I know, it has taken me way to long to update, but I had pictures to show but I was to lazy to get my camera so I never really wanted to update. Lets see, I had a really dissapointing evening of spinning at the beginning of the week. It all went wrong and I was ready to throw everything out of the window. But I didn't. I started over the next day and actually did some super spinning! 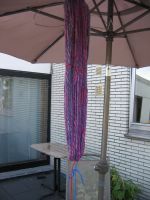 I didn't take pictures of the actual spinning, but I did take pictures of the yarn drying! 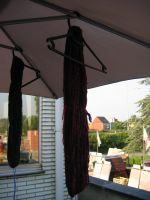 Ok, I know, there isn't much to see, but I just wanted to show off my first batch of handspun hanging on the balcony to dry. The one in front in the first pic is actually the left over of the first nights horrible spinning. It's red/black roving I bought ages ago at Ebay. 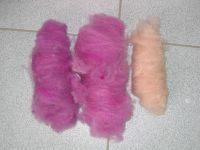 Then the one in front in the second picture is the same roving but spun up nicely in a fat thick and thin 2 ply. I'm going to use the first single to make a mini felted thingie like I tried before, I think this yarn will felt perfectly. The 2-ply has no destination yet. The yarn in the back on the second picture is the one I spun ages before. I washed and set it now. Yeah, I didn't do that before. Anyway, it's green/blue/black, bought from the same person at Ebay. This one is probably going to be socks though I still have to figure out how to know I'll have enough yarn. I know I need about 100grams and I think this skein is, though I'm not sure. Here's a close up of the red/black yarn (it's really more burgundy-red in reality) and in the back you can see the green/blue/black. Yesterday I was spinning on this roving, which is from the fleece I got (by the way, I got a second one today and it'll keep me busy all through Winter I think). I washed it but am not to happy with the greace that's still in it. I'll try more washing. Then I died it, and carded it. 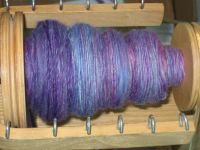 I spun up the bright pink/purple and it spun quite nice. But, unfortunately, while trying to do a navajo-ply (my first) my wheel broke down! At first I was stunned, didn't know how to react. Then I freaked! Then I picked up the phone and called the lady I got the carder from as she sells parts for the Louët spinning wheels. I could go over in the evening and her husband repaired my wheel. Of course I cut the string on the navajo plying and just put the yarn aside. No clue yet what to do with it. I might spin more singles in different colours and then use them for fairisle socks or so. First pic is the single I spun. Then I put it all on a center pull ball and then from that ball I plied it. 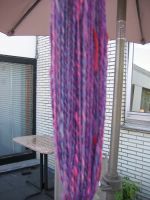 This is some of the handpainted german wool roving I did last week (I post pictures here). While plying it I really regretted doing that as the single was looking so nice. But I'm always afriad the single won't be strong enough when knitted. Well, I have some merino in the same colours and that'll stay singles. :D This is about 100grams and it'll be socks. 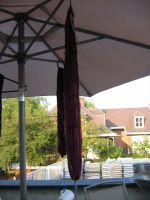 Yeah, lots of pinks and purples, but it's really nice and really my colour! When at the lady to get my spinning wheel fixed I bought more merino and german wool roving! She's so cheap! I can't wait to start dyeing more. I hope my wheel won't brake down again 'cause she's away for a month. I saw that lovely Louët S45 again and I really can't wait till I have saved up to buy one! I desperately want such a great wheel! Mine is really slacking and might have another problem, but I'm going to ask our handyman - not my boyfriend! - to take a look at it, hope he can fix it. I'm going to card the alpaca and the mohair soon too, so I can start spinning on the yarn for my friend Elise. It's taken me way to long. Plus I'm washing more of the fleece. 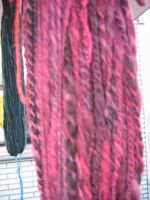 And I want to dye the mohair I got unwashed. 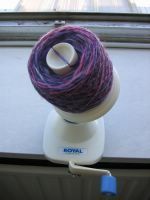 After that it's up to the lovely roving I got from Hello Yarn which will spin up perfectly I'm sure! I'm getting the hang of this, I can spin fine singles which is perfect for the socks I plan on knitting with them! Oh, almost forgot, but I got some black Shetland wool from the lady as well, it's already carded so I'll spin that up for more fairisle stuff (mittens, hats, socks). I am knitting, though I forgot to take pictures. I'm working on fairisle socks and the squares for the blanket. Well, squares, only one done so far. Hopefully I'll get a lot of knitting done on our trip to Italy. I want to learn how to use my drop spindle so I can sping a little over there as well. I might be crazy. Oh well, the lady from the wheels takes a wheel with her, till last year a huge one but this year she's taking the S45 which is of course perfect for traveling. She is going in a mobile home though, so that makes the difference. I don't think my sisters would like the company of a spinning wheel on the backseat of the car! I might be getting a new job, it's all kind of strange. If you want to read more, please visit my journal, as I've written it all down there and I don't want to repeat it again! Yeah, sorry, I know, I'm lazy. But it's mighty hot over here and I'm just mostly all about sleeping. I get very active in the evening but boyfriend doesn't like that to much. To bad. Ok, off now to write a letter and knit some! Those colours are truly yummy. Just my colours too!